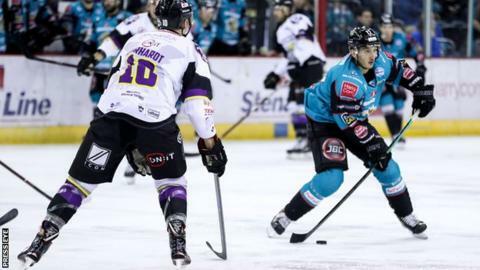 Belfast Giants' Elite League title hopes suffered a blow with a shock 5-2 defeat at Manchester Storm. The Challenge Cup holders allowed a 2-1 lead to slip as they conceded four goals in a final-period collapse. Kyle Baun and Jim Vandermeer had scored either side of Storm's Dan Byers as the Giants led going into the third period. Mike Hammond, Luke Moffatt, Ciaran Long and Byers all scored in a stunning Storm response leaving the Giants four points adrift of title rivals Cardiff. The Giants have now played the same number of games as the Elite League leaders and with just four matches remaining, Adam Keefe's side will need an unlikely collapse from Cardiff if they are to claim their first title since 2014. Chasing a sixth straight win to keep the title race alive, the Giants took the lead over their hosts when they converted their second powerplay of the opening period. Just moments after Manchester's Matt Ginn had produced a vital save, the visitors made the breakthrough when Baun hammered home a shot with 13:21 on the clock that gave his side a deserved lead at the first break. Byers levelled the scores midway through the second period when he finished off Hammond's pass at the back post but the Giants regained the lead on 35:45 when Vandermeer took advantage of another powerplay with a powerful shot. It took the home side just over a minute of the final period to draw level again when Hammond scored while Giants' Jonathan Ferland served a two-minute spell in the penalty box. Manchester took the lead for the first time less than 30 seconds later as Hammond turned creator again to set up Moffatt, leaving the shell-shocked Giants battling to salvage their title prospects. Long fired Manchester into a two-goal lead at 52:13 and a four-minute penalty for Chris Higgins left an increasingly desperate visitors a man down in the closing stages, which allowed Byers to round out the scoring by firing into an empty net in the dying minutes.